Whether you are at the office or planning next weekend’s birthday party, the fact is you can be considered a “Project Manager” in nearly every aspect of your life. So it is only fitting we provide a proven system to help you plan and complete more of your projects now, so you can enjoy more money, less stress, and more life in 2014! First, let’s define a “project”? According to David Allen, the time management guru and author of Getting Things Done, a project is any task that will require more than one action item to complete. This definition alone will completely change how you think of any task going forward. Most people write on their to-do list “Buy New Lawnmower”, and consider this a task. The reality is there are many little steps that go in to this task. What’s your budget? Gas or electric? How much horsepower? 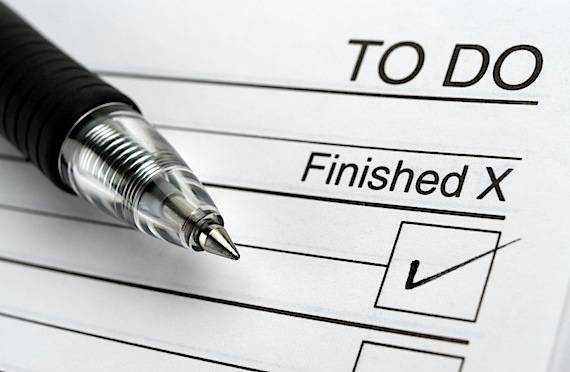 Once you shift how you think of a task, you will understand why so many to-do items never get completed. Now let’s teach you a proven process for planning and completing your projects! Let’s apply these five phases to a popular financial goal, such as paying off consumer debt. The purpose is fairly easy…free up monthly cash flow and reduce stress by paying off your consumer debt. Your outcome visioning is what you believe having no consumer debt would look like, how you and your family would feel with everything paid off, and what you might enjoy with all that extra cash flow. Next, you need to brainstorm all the ways to get your consumer debt paid off. How much extra money can you apply to paying off your debt faster? Which debts do you start with? Should you pay a little extra on each debt, or apply all of your extra money to the largest debt, or the highest interest rate? As you brainstorm, you will see just how many action items are associated with this project. Now you must organize your thoughts. What do you need to do first? You might begin by listing your debts, including the amount owed, interest rate, minimum payments, and any annual fees being charged. Then you may review your budget to find the areas to free up money for this project. Once everything is organized, the fun can start. You now will identify your next actions. Complete the inventory list of current debts. Decide which debts to pay first. Then decide how much extra to pay. Start thinking of a project as any task requiring more than one action, and practice applying these five phases. Remember, our goal is to help you enjoy more money, less stress, and more life! Learning how to be more effective when planning and completing your projects, both at work and at home, can help you enjoy all three! This entry was posted in Blind Spot 1: Developing a Plan and tagged debt management, developing a plan, finances, financial future, goals and dreams, home loan, money, mortgage lenders, Refinancing, saving. Bookmark the permalink.